How to help policymakers formulate solutions to complex problems by using design thinking? Justin Cook illustrates how Sitra's Studio Model was conducted at the U.S. State Department. 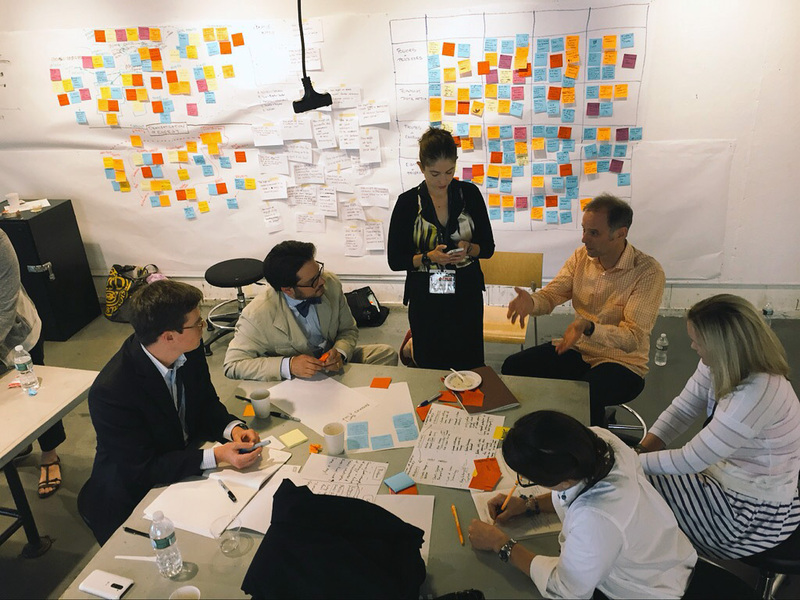 How to help policymakers formulate solutions to complex problems by using design thinking? Justin Cook illustrates how Sitra’s Studio Model was conducted at the U.S. State Department. Over the first week of August, I took a break from regular duties at Sitra to help launch a new collaboration between the Rhode Island School of Design (where I am on the faculty) and the United States Department of State Bureau of Education and Cultural Affairs. The inaugural Institute for Design and Public Policy was a structured “Studio” course that originated right here at Sitra’s Helsinki Design Lab (HDL) team during 2009-2010. Originally, my HDL colleagues and I developed the Studio as a lightweight, agile innovation instrument primarily intended for government or other “owners” of complex challenges such as sustainability, aging populations, or education. In simple terms, the Studio was a space and time in which a complex challenge could be more accurately defined (outside of national, institutional or individual biases) and a portfolio of more durable and impactful solutions could be developed. Since our initial road test of the Studio Model in Helsinki in 2010, we have conducted many Studios around the world, from Thailand to Sweden to MIT in Cambridge and inspired many others*. In each subsequent iteration, the model has evolved to capture new kinds of opportunities and address unique challenges faced by different kinds of stakeholders. Somewhat unexpectedly, the Studio has also proven to be an effective platform for immersive training in the use of design as a strategic competency for organizations facing complexity. This is design pushed way beyond the realm of cultural affairs (objects and aesthetics) to a practice that uses tools resembling traditional design competencies (future—past simultaneity, problem framing, integration, visualization, stewardship, etc.) to produce better processes that yield better outcomes. A highly visible off-shoot of design operative in a systemic context is a class of tools and approaches popularized as design thinking. Firms such as IDEO and Luma, and organizations such as Stanford’s d.School, have made great strides, especially in the business world, but increasingly in government, to make design available to workers who are not traditionally trained in design or other creative fields. In the U.S. Federal government, design thinking has been gaining traction in many departments. The Office of Personnel Management’s Innovation Lab is one example where design and other alternative approaches to problem solving are given the infrastructure and resources to enable experimentation. And frequently, the results of workshops organized around design are compelling and impactful. But as we argued throughout HDL’s most recent run (2009-2013), thinking is not enough. It is the combination of thinking and doing — of designing, deploying and stewarding — with all of the learning and brain damage that entails, that is necessary to make real progress on our most difficult challenges. With this in mind, we set out to chart a new path for design in government. With HDL’s Studio Model as our platform, we folded in some of design thinking’s best tools together with lectures from experts on creative practice, ethnography, and user-centred design, to build a course that was at once an immersive experience in addressing a complex challenge (in this case, the democratization of energy), but also instructional. The goal was to enable policy makers not only to have the confidence to reframe a problem in their own terms, but to have the tools, bound together by design sensibilities, to tackle the problem and create solutions. For this inaugural Institute, we were delighted that our invitation to apply went viral; spilling out of our intended audience at the State Department and reaching rising leaders from the CIA, Department of Defense, FDIC, Department of Homeland Security, to private and nonprofit sector participants from organizations such as Bridgespan Group and Born Free Africa. No participant had deep expertise in energy issues (although we are all familiar with its use) and even less experience with the practicalities of the democratization of energy. But we all recognize the trend toward decentralization and personalization in different fields. The conflict and opportunity inherent in this kind of structural transition is evident in all of our lives both inside and outside of our workplaces. And the structure of the Studio Week—with the first two days aimed at building shared understanding and shared experience—enable us to make connections between our professional expertise, our lived experience and the deeply complex issues surrounding the production and transmission of energy. By Friday, just four days after being briefed on the topic, the participants had deeply engaged the challenge and were able to have a very sophisticated conversation about energy and a marketplace in transition. But most importantly, the participants were able to formulate solutions that could credibly intervene in the current system and provoke its transformation into a new structure that would better meet the needs of all of its stakeholders. Our Friday afternoon jury of invited experts confirmed as much. One juror, the senior energy policy maker for the state of Rhode Island proclaimed that the participants had successfully designed a new energy system that was both believable and clearly for the people. *Because of Sitra’s public mission, the Studio Model was conceived of as an open source innovation platform. Our book on how to build your own studio is available for free here. **Aalto University’s Design for Government project, among others, continues this work in Finland.